Retell: Lucas constantly gets picked on by the neighborhood bully. He takes out his frustration on the ants in front of his house. 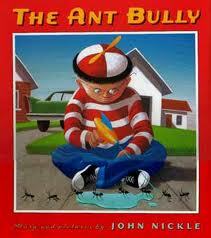 The ants decide to take revenge and teach Lucas a lesson. Thoughts: Apparently this story was made into an animated movie back in 2006. I guess I’ve been out of the loop. This is a great read aloud for teaching about karma, the Golden Rule and the basic concept of treating others (even non-humans) with respect. It’s also a great mentor text for students writing fantasy stories. The structure is short and simple enough to mirror the fantasy stories that upper grade students may be writing. It’s also great for demonstrating how stories can be structured around teaching the reader a lesson. Unfortunately, it looks like this book is out of print. Definitely worth a trip to your local library. Retell: A niece describes her annual road trip with her favorite aunt. My Thoughts: I’m beginning a new unit this week–a unit devoted to strengthening my students inference and interpretation skills. I’m looking for short and engaging texts to read aloud. This is a great text for modeling how readers can infer a lot of information about a character/relationship from a simple line of text. Retell: Ada Ruth can’t wait for her mom to return home from Chicago. The story takes place during World War II. Ada Ruth’s mother has gone North to seek jobs on the railroad. With help from her grandmother and her new feline friend, Ada Ruth is able to wait patiently for her mom to come on home. My Thoughts: This is a great text to read aloud during an Historical Fiction unit. It’s a useful text for modeling how readers think about symbolism (or alternatively how writers incorporate symbolism). For example, it would be helpful to point out the meaning of the kitten in the story. One could read the story without giving much thought about the kitten’s importance. However, upon closer reading, one could read into the kitten’s significance. Perhaps the kitten is a symbol that represents Ada Ruth’s hope that her mother will write soon. Perhaps the kitten symbolizes her loneliness.